Within the state, California Department of Fish and Wildlife (CDFW) owns and manages over 1 million acres of land. CDFW is the third largest landowner in the state, with Federal as the first and California State Parks at 1.4 million acres coming in second. 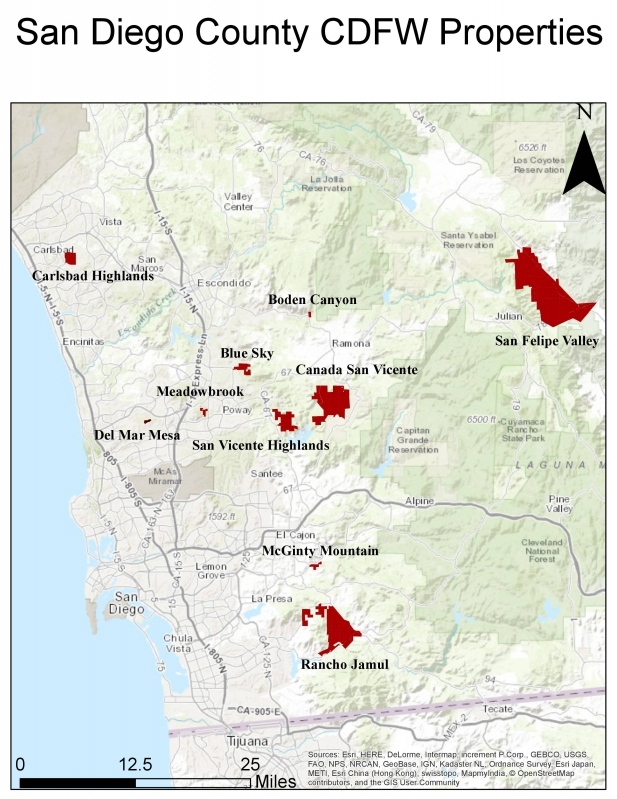 Within San Diego County, CDFW owns and manages properties across the County ranging in size from 17,800 acres to under 100 acres. Most of these properties lie in rural parts of our County and are not surrounded by urban sprawl, but a handful of properties are situated within developed urban areas. In many cases these properties have never allowed any significant trail access for the public and have barred mountain bikes from the properties altogether. The result among the properties in the urban sprawl has been a significant development of social trails and in many cases these properties are the only open space for residents to recreate within. Several examples exist within our community of mountain bikers and local trail users working with land managers to provide reasonable access to preserved open space and in turn helping to close and eliminate social trails. CDFW to date has taken no official action which will assist in managing these properties and in many cases has refused to allow access to the public and key properties throughout the County. Below is a list of a number of CDFW properties that in some instances allow no legal access for the public and no access for mountain bikers. In most cases the trails and roads we are looking for access to already exist and in many cases are easemented utility roads that are maintained for use by commercial vehicles. Blue Sky Ecological Reserve This property is situated within the City of Poway and providers connectivity for existing multi-use trails at Lake Poway and the surrounding City. McGinty Mountain Ecological Reserve Situated to the East of Spring Valley and El Cajon this property contains a vital connection for a popular network of trails that USFW has worked to provide legal access to. Rancho Jamul Ecological Reserve Although a rural property situated within Jamul this property has several planned developments on many sides of the property due to a patchwork of ownership. With no viable plan of public access and thousands of residents planned to live on all sides of the property is creating a recipe for social trails and habitat destruction. Meadowbrook Ecological Reserve This property is situated to the East of the 15 freeway and sits within mixed ownership in the City of Poway. Although public access has been provided by some adjacent land managers (City of San Diego and City of Poway) no management plan or trail access has been provided by CDFW. Currently there are miles of social trails sitting within the property with no effort ever being made to engage the public or create a sustainable public access plan. Del Mar Mesa Ecological Reserve located within Carmel Valley Area this Ecological Reserve sits within mixed ownership of USFW and the City of San Diego Open Space. Currently this property contains a road with the only West to East access point within the Area. Several plans have been developed to attempt to build a trail around the property, but none has been viable. Currently the property has no public access and is fenced around its entire perimeter. Boden Canyon Ecological Reserve currently this small property contains a service road that provides the only viable link for the Coast to Crest Trail (a 50 mile cross County Trail System). Currently no mountain bikers are allowed to cross the .4 mile segment of road and are required to ride the shoulder of highway 78 for 5 plus miles to bypass this section in Ramona. There is no bike lane and the highway has a speed limit of 55mph. On both sides of this road there is a public trail in City of San Diego and Forest Service ownership. San Felipe Valley Wildlife Area San Felipe Valley contains an existing piece of the Historical California Hiking and Riding Trail (CHRT). No access has ever been granted to this trail and is a critical piece of the trail with no ability to bypass the property. Further CDFW has claimed the CHRT easement is no longer valid. San Vicente Highlands Ecological Reserve This large property contains an existing historical road Foster Truck Trail. This property or road has no legal public access and currently provides the only viable connection from Lakeside/Poway to Ramona on a trail. On both sides of this trail sits open space with public access, Sycamore Goodan Ranch (Poway) to the West and Boulder Oaks to the East (Ramona). Canada de San Vicente Ecological Reserve A recent purchase of a sizeable historic ranch in Ramona provides no access for the public. The property contains miles of roads that provide access to several historic ranch houses and estates. Currently the property has no public access outside of employees of CDFW to live and occupy the existing structures for study or retreats. It is notable that during the public scoping process a sizeable number of respondents wanted the State to provide an element of public access, but all requests were ignored. April 2019: Please write to your elected representative to support recreational access at CHER. Template available HERE. March 7, 2018 SDMBA holds a meeting regarding access to CHER at GoPro in Carlsbad attended by over 70 concerned trail users. April 29, 2019. SDMBA holds meeting regarding access to CHER at ZOIC Clothing in Carlsbad attended by over 100 concerned trail users.